In keeping with our practice of continually reviewing emerging trends and changes in Wisconsin insurance law, the insurance recovery team at Quarles & Brady has compiled this year’s top ten Wisconsin insurance cases. While only one Wisconsin Supreme Court case made the cut, review was granted for several court of appeals decisions that address important issues for policy holders. This article will get you up to speed on the current state of these issues and help you anticipate what’s to come in 2018. A sometimes overlooked aspect of Wisconsin insurance law concerns the right of an insured to recover interest at the heightened rate of 12 percent n insurance claims once 30 days goes by from submission of a proof of loss. In fact, a specific statute Wis. Stat. § 628.4 applies to that situation, and it was at issue in this case, which involved a catastrophic auto accident involving a commercial truck and a mini-van full of passengers. Litigation and settlement discussions ensued for many years in what was ultimately agreed to be a policy limits case. Third-party claimants settled with the truck company’s insurer for policy limits, but because it took so long to achieve the settlement, the claimants sought statutory interest on the delayed payment. The insurer was found liable for nearly $700,000 in interest, which it appealed. Prior precedent established that the delayed payment statute requires an insurer to pay interest when (1) there is “no question” of the insured’s liability; (2) there is a “sum certain” of plaintiffs’ damages; and (3) the insurer received written notice of liability and the “sum certain” damages. The court had little difficulty finding those criteria met in this case. An uncertain award was, nonetheless, a “sum certain” when it clearly exceeded policy limits; nor did the possibility of contributory negligence did preclude application of the statute. Given the admitted fault of the insured and degree to which damages exceeded policy limits, there was no question that the insurer owed policy limits. Finally, the court had little problem finding the statute applicable, even though there were multiple insureds. Questions concerning allocation of admittedly owed policy limits among multiple claimants would not impact the policies behind awarding prejudgment interest in cases where the insurer’s liability is clear. General liability policies cover accidental property damage, but not damage to the policyholder’s “own” work or product. These “business risk exclusions” prevent an insured from recovering the cost of repairing faulty workmanship, but leave coverage in place for resulting property damage or bodily injury. Haley involved a seemingly clear example of how this rule should work in practice a window manufacturer whose windows leak. The “your work” and/or “your product” exclusions in the manufacturer’s liability policy would certainly preclude coverage for the cost of replacing the windows. But what about the cost of repairing water damage to other parts of buildings/home parts that the window manufacturer did not make or sell? Until last year, the answer would certainly seem that liability policies cover those costs. But that assumption was tested last year in Wisconsin Pharmacal Co. LLC v. Nebraska Cultures of California, Inc., 2016 WI 72, 367 Wis. 2d 221, 876 N.W.2d 72. In that case, a supplier of an ingredient to a dietary supplement pill was sued for supplying the wrong ingredient. The Wisconsin Supreme Court denied coverage to the supplier by applying the economic loss doctrine’s so-called “integrated system” analysis. The court held that each supplement pill was an “integrated system,” such that damage by any defective component to the “system” would be considered damage to the component itself and not to “other property.” Because the supplier damaged only an “integrated system,” the insurer owed no coverage. A few months later, a federal district court in Madison took the integrated system analysis a step further and held that a building is an integrated system such that water damage from leaking defective windows is not covered under the window manufacturer’s liability insurance. See Haley v. Kolbe & Kolbe Millwork Co., Inc., Case No. 14-cv-99-bbc, 2016 WL 4487807 (W.D. Wis., Aug. 25, 2016) (slip copy). The Haley decision may help prevent the unique facts of Wisconsin Pharmacal from making bad law in other areas. It may be one thing to apply an integrated system test to deny coverage in component product claims, like a pill it is quite another to apply it to a building, where construction defect and faulty workmanship claims routinely give rise to coverage. In yet another case addressing the sometimes thorny issue of what qualifies as an “occurrence” in a general liability policy, the Seventh Circuit held that an insured’s adulteration of a product to conceal certain quality deficiencies did not constitute an occurrence or more specifically, an “accident,” as the policy defined it. The Seventh Circuit further held that the insureds’ statements to customers concealing the adulteration and promoting the continued sale of the product, even if not intentional, also did not rise to the level of an occurrence. In determining what constitutes an occurrence, the Seventh Circuit advanced an analysis requiring evaluation of both the underlying behavior and the consequence of the behavior to determine whether an occurrence has taken place. The Seventh Circuit noted that Wisconsin recognizes certain deliberate conduct which produces an accidental result may indeed qualify as an occurrence, i.e., the court cited the typical motor vehicle accident arising from a speeding vehicle as a common example. However, in this case, the court said that intentionally adulterating a product to make it appear to have desirable qualities did not qualify as an accident or occurrence. The court explained that neither the behavior nor the consequence of the behavior could be classified as accidental. Separately, the Seventh Circuit tackled coverage for this same claim under a representations and warranties (“reps and warranties”) insurance policy. The policyholders had sold their company to a third party who upon discovering the sellers had been adulterating their product sought reimbursement of the purchase price. The sellers settled with the buyer to avoid litigation but then sought reimbursement for the settlement from their reps and warranties carrier (this was the rare situation where the seller had purchased such a policy; usually it is the buyer). The Seventh Circuit held that the policy excluded coverage for the underlying settlement because the claim was based solely on fraud which was specifically excluded in the policy. Can There Be a Duty to Indemnify Without a Duty to Defend? It is a well settled tenet of insurance law that the duty to defend is broader than the duty to indemnify. Does that mean that there can never be a duty to indemnify if there is no duty to defend? That was the issue in Stimac Family Trust v. Wisconsin Power and Light. The merits of the underlying suit—a property owner sued a contractor for negligent work in restoring a residence—are neither novel nor noteworthy. Rather, it is the procedural aspects of the case that make it important. The contractor tendered the case to its insurer, who denied defense and coverage but agreed to defend under a reservation of rights “out of an abundance of caution,” seemingly a wise choice given the severe consequences to an insurer who breaches its duty to defend. The trial court bifurcated and stayed the underlying case to allow the insurer to contest coverage. In response to the insurer’s no coverage motion, the insured introduced evidence showing that, regardless of what was alleged in the complaint, there was evidence showing that the true state of affairs showed a covered event. The trial court disregarded this evidence, ruling that under the “four corners rule,” in which the duty to defend is based solely on comparing the complaint with the policy, there was no possibility of coverage. The insurer was, accordingly, dismissed. The Court of Appeals reversed, deciding that this was the wrong analysis. According to the Court of Appeals, once the insurer agreed to defend, the four corners rule was no longer applicable. Instead, the issue was whether the evidence showed that the insurer had a duty to indemnify. The insured’s affidavits showed that there was indeed such a duty. Stimac could be read as suggesting that the insurer would have been better off not defending at all and taking its chances under the four corners rule in a subsequent suit brought by the insured (though that choice would have, of course, carried its own risks). The more hopeful view, at least from a policyholder’s standpoint, is that regardless of what the complaint says, coverage may still be in play if there are underlying facts showing that the policy covers what is really at stake in the lawsuit. Simply put, whether the insured is permitted to introduce evidence showing coverage should not turn on whether or not the insurer has defended the case. It is not just insureds who would benefit from such a reading. If a coverage analysis depends on whether the insurer defends the underlying case, it will create something of a Hobson’s Choice for insurers, as they will weigh the pros and cons of accepting a defense tender with the knowledge that either choice could prove costly. Ultimately, this will result in more uncertainty, more tenders being denied, and more coverage disputes. Like Ratajczak (above), Talley v. Mustafa also addressed what constitutes an “accident,” in this case in the context of negligent hiring, training and supervision. The facts were straightforward¾an employee assaulted a customer at the insured’s store, breaking the customer’s jaw. The customer filed suit against the store owner alleging that his negligent training and supervision caused the injuries. The store owner’s insurer moved for summary judgment, arguing, first, that there was not an “accident” and therefore no covered “occurrence,” and, second, that coverage was barred by the “intentional acts” exclusion. The court rejected both arguments. In doing so, it followed Miller v. Wal-Mart Stores, Inc., 219 Wis.2d 250, 580 N.W.2d 233 (1998) and Doyle v. Engelke, 219 Wis.2d 277, 580 N.W.2d 245 (1998), particularly Doyle, which held that a reasonable insured would expect “accident” insurance to cover any negligent acts, including negligent supervision. The court distinguished Schinner v. Gundrum, 2013 WI 71, 349 Wis.2d 529, 833 N.W.2d 685 which had found no coverage for the insured host of an underage drinking party that resulted in an assault. Talley distinguished Schinner as denying coverage “because the allegations in the complaint and evidence in the summary judgment record made it clear the insured ‘took a number of intentional actions that ultimately caused [the plaintiff’s] bodily injury,’” whereas here, “neither the complaint nor the evidence suggests, and no one has hinted, that Mustafa—the insured—committed any intentional wrongdoing.” Id., ¶ 26. Through Talley, Doyle, Miller, and Schinner, Wisconsin courts have focused the coverage inquiry for negligent training and supervision claims on accusations against the insured employer or supervisor—not the conduct of the employee. This seems appropriate and in keeping with the nature of all-risk, accident-based coverage, as there is no logical reason that such a policy would preclude coverage for non-intentional conduct even if that conduct was alleged to have led to intentional conduct by a non-insured. The Supreme Court has granted review of this case. It will be an important case to watch in 2018. The Wisconsin Court of Appeals decision in Wosinski v. Advance Cast Stone Co. addressed two significant coverage issues with real world implications for many policyholders. The case arises out of the tragic, and well-publicized, incident at the O’Donnell Park parking structure in Milwaukee in which a 13-ton decorative concrete panel manufactured and installed by Advance Cast Stone Co. (ACS) fell from the exterior of the structure, killing a 15-year old boy and injuring two others. The injured parties sued ACS and its insurer, Liberty Insurance Underwriters, Inc. (Liberty), among others, alleging negligence in the installation of the panel and intentional concealment and misrepresentation in ACS’s failure to disclose deviations in the installation methods in certain documents. Liberty defended ACS under a reservation of rights, but failed to move to bifurcate coverage issues from the liability trial and instead affirmatively requested special verdict questions intended to resolve factual disputes relevant only to its coverage defenses. The trial court found that Liberty breached its duty to defend ACS in attempting to advance its own interest in defeating coverage in this manner. On appeal, the court reversed, holding that Liberty did not breach its duty to defend ACS by submitting the special verdict questions relating to its coverage defenses. Nor was Liberty required to move to bifurcate coverage issues from the liability trial. Nevertheless, the Court of Appeals went on to reject Liberty’s claim that the jury’s finding of intentional conduct by ACS necessarily defeated ACS’s claim for coverage. To the contrary, the court held that coverage existed because the jury found ACS’s negligence to be a cause of the plaintiffs’ bodily injuries. That the jury also found ACS later intentionally concealed and misrepresented facts relating to its negligence did not destroy coverage. The takeaways? First, the insured must insist on independent counsel (i.e., counsel that represents only the insured), who must remain vigilant for attempts by any defending insurer to defeat indemnity coverage and should move to bifurcate proceedings to avoid the prejudice inherent in simultaneously defending the plaintiff’s liability claims and an insurer’s coverage defenses in the same trial before the same finder of fact. Second, in making any coverage determination, it is important to parse the alleged conduct at issue. Where the insured’s negligent conduct is a cause of the plaintiff’s injuries and consists of action separate from any intentional conduct by the insured, liability coverage may well exist. The standard commercial general liability policy includes coverage for so-called “personal and advertising injury,” a form of coverage that can sometimes come into play with certain business torts, such as trade libel or defamation. In this case, the court was asked to determine if it applied to a tortious interference case where the plaintiff claimed that the defendant had interfered with his customer relationships by falsely claiming that he was in breach of a non-compete agreement. The policy contained a standard “breach of contract” exclusion which stated that there was no coverage for injury “arising out of a breach of contract, except an implied contract to use another’s advertising idea in your ‘advertisement.’” The court found that the tortious interference claim “arose” out of a breach of contract because the allegedly defamatory statement about the plaintiff related to an alleged breach of a non-compete agreement, which in turn depended on whether the party with whom the plaintiff had entered the non-compete (which had been given as part of a sale of business) had breached an underlying asset purchase agreement so as to give rise to rescission of the non-compete. The court relied on the “arising out of” wording of the exclusion, noting the very broad reading it has been given in prior case law, and concluding that it meant that the exclusion was not limited to claims for breach of contract but would extend to any claim that had a “causal relationship” with a breach of contract. While the court’s decision can, in some respects, be defended from the standpoint of the policy language, it hardly seems in keeping with the parties' expectations. Personal and advertising injury is already a very narrow grant of coverage, but insureds at least expect it to cover disparagement-related claims. The breach of contract exclusion is thought of as preventing insurance coverage for . . . breach of contract. The fact that this disparagement claim happened to relate to a false statement about a breach had nothing to do with the underlying purpose of the coverage. And it could certainly be argued, at least from an efficient or proximate cause standpoint, that the “causal relationship” to the alleged injury was a defamatory statement, not any breach of contract. One ancillary issue was that the insured entity had inherited the agreements through its acquisition of the original party who purchased the individual’s business. The insured argued that the breach of contract exclusion did not apply because it lacked privity with the individual. But the court rejected this, noting that the policy excluded coverage for claims merely “arising out of” the contractual relationship, and here that meant the claims do not need to be directly tied to a contract between the claimant and the insured. This was a late notice case and erodes policyholder protections under the Wisconsin late notice statute by both shortening the deadline for putting underinsured motorist (UIM) carriers on notice, and increasing the burden of disproving prejudice to insurers for notice after one year. In 2010 Robert H. Shugarts, a deputy sheriff in Eau Claire County, was injured when his squad car was struck by a vehicle driven by Dennis Mohr. Progressive, Mohr’s insurer, initially denied coverage because Mohr hit Shugarts intentionally. Almost three years later, after Shugarts filed suit, Progressive disclosed its bodily injury limits to Shugart in discovery. The limits were substantially below Shugarts’ damages. A little over a year after that, Shugarts’ counsel notified his underinsured motorist (UIM) carrier, Allstate, of the claim. Allstate denied the UIM claim as untimely. The trial court denied coverage based on untimely notice. The Court of Appeals agreed with the trial court, rejecting Shugarts’ argument that he had complied with the notice requirements. Under Shugarts, as it stands, the best practice for policyholders is first, to put UIM carriers on notice at the same time as tortfeasors’ liability insurers, and if over a year has passed be prepared to engage in a very rigorous no prejudice inquiry. The Supreme Court has accepted review. This case involved the often tricky area of additional insured endorsements. Ryder contracted to lease trucks to Rockline Industries, LLC. The contract required Rockline to maintain liability insurance covering Ryder and Rockline. A Rockline employee was injured while getting into a Ryder truck, then sued Ryder for negligent repair of the step. Ryder tendered the claim to Rockline’s insurer, National Fire Insurance Company of Hartford. National denied coverage and Ryder filed for declaratory judgment. Two provisions were at issue: (1) a “designated insured” endorsement naming Ryder, but only where it otherwise qualified as an insured under the “Who Is An Insured” section of the policy; and (2) an “additional insured” provision naming Ryder, but only as to “acts or omissions” of Rockline. The court denied coverage under the designated insured section because Ryder was not, under any reading of the policy, already an insured under the “Who Is An Insured” section. This raised the question as to what purpose the designated insured provision served, which the court concluded was “not much”¾perhaps only to serve as a document the named insured could show to a third party when that party does qualify under the “Who Is An Insured” section as one who is vicariously liable for the named insured's actions. As for the AI endorsement, the court found coverage. As is often the case, the AI endorsement was limited to liability arising out of the named insured’s, i.e., Rockline’s, “acts or omissions.” So Ryder’s negligence in maintaining the step would apparently not be covered. But the story did not end there. The court noted that the AI endorsement merely requires that injury "resulting from" the “acts or omissions” by the named insured (or, as in this case, its employees). It did not require any negligence on the part of the named insured or its employees. Because the accident occurred at least in part because of an “act or omission” on the part of the Rockline employee, i.e., the employee’s act of stepping into the truck, the AI's limited trigger was satisfied. The case is significant in its treatment of AI endorsements. Separately significant, the court declined to find “automatic” coverage due to the insurer’s breach of duty to defend, because there had yet been no liability or damages determination, with the court suggesting that some degree of causation might be necessary between the breach of the duty to defend and any such liability or damages. When is a Party Entitled to be Indemnified for Its Own Negligence? 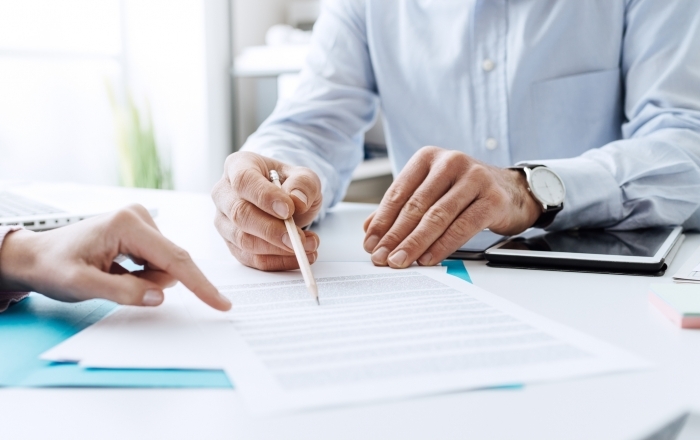 This is not an insurance case per se, but involves the closely related question of contractual indemnification and insurance requirement provisions in commercial agreements. Cintas performs fire equipment inspections on commercial properties. It contracted with Becker, a property management company, to perform an inspection and at some point following the inspection a sprinkler system failed, causing massive flooding and property loss. Cintas’ standard contract contained a provision stating that the customer would “defend, indemnify and hold harmless [Cintas] from any claim, charge, liability or damage arising out of any goods or services provided by [Cintas] hereunder, including any failure of the goods or services to function as intended” and would procure insurance against any such loss. The agreement also contained an Ohio choice of law provision. Following the loss the property owner’s insurer (who also insured Becker) paid it, then sued Cintas for negligence, and Cintas impleaded Becker for indemnification. The trial court ruled that the indemnification provision did not meet Wisconsin’s requirement that there can be no indemnification for a party’s own negligence absent an express statement to that effect or an unmistakable intent from the contract as a whole. The trial court noted that the result would have been different under Ohio law, but refused to apply the choice of law provision on public policy grounds. The Court of Appeals reversed, noting that the specificity test was satisfied both because the indemnity language went beyond a general promise to indemnify, and because other provisions, in particular the insurance procurement provision, made clear that the purpose of the provision was to allocate the risk of liability to Becker. The Court of Appeals had no occasion to reach the choice of law issue in light of its ruling that Cintas was entitled to indemnification under Wisconsin law.